You can never know enough about WordPress, the Internet’s most popular blogging platform. As new security exploits become available, it’s best to keep up to speed on how to secure them. SixRevisions.com has put together a list of 12 tips and hacks you can use to lock down your WordPress installation and make sure it doesn’t become vulnerable to prying eyes. I’ve been working down the list to secure multiple blogs of mine — you can never be too careful. If you’re like me, finding enough pocket room for all of your gadgets can be a bit of a nuisance. Between my Flip camera, cell phone, iPod, digital camera, memory sticks and keys, I need some extra storage. Other than resorting to carry a purse, there’s this little gadget that I picked up recently on ThinkGeek.com. 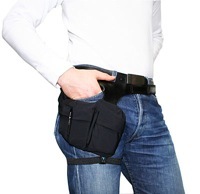 The Gadget Hip Holster is a neat accessory that fits around your leg and provides extra storage space for all your gear. This comes in handy when I’m out doing a photo shoot (I’m also a photographer besides an Internet marketer). The price might be a little high — not really sure this was worth $49.99, maybe $30 tops, but nevertheless, I’m liking it. Will You Upgrade to Windows 7? Microsoft’s newest operating system comes out shortly, and a lot of critics have been pretty harsh on it due to the failure of Vista. Windows 7 promises to be the ‘best’ upgrade you’ll ever make — wasn’t Vista supposed to be like that? I know I won’t be upgrading, as I’m a newly converted Mac user now. HotHardware.com looks at Windows 7 in more detail and shows you the three versions available. Is that a fanny pack you’re planning on sporting?! Oh, no…we need to talk! Windows 7 Is that a fanny pack you’re planning on sporting? !